Welcome to Kaiyote Tours: Travel with the Best! 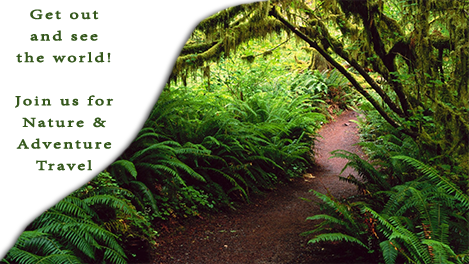 We are based in Port Angeles, Washington and our travel company has two parts: One is providing tours in Olympic National Park and the other is organizing International Birding and Nature Tours; specializing in Birding, Botany, Wildlife Viewing and Nature Travel. International Travel: If you love birds, wildlife and the thrill of getting to remote places, the trips we offer are for you. On all trips, it is our goal to see as many birds and interesting critters as possible, but we also, however, appreciate that travel is always more than that: The places you will get to in your life and the people you meet along the way will be some of the most memorable experiences you will have. Olympic National Park: We offer trips for all levels and interests, from driving tours to week-long treks across the park. Unique Experiences and great opportunities for learning and adventure. We travel in small groups of 4 - 8 travelers with knowledgeable guides. We are outdoor educators; teaching you about the natural world is our focus. Adventure levels: We have classified the level of difficulty for each international trip to help you understand and to decide if a trip is right for you. These classifications are based on our specific tours. Easy: These tours do not require you to be in any particular level of fitness; everyone is welcome. Everywhere we stay will have reliable electricity and we will be close to “state of the art” medical facilities. Public health and transportation standards are considered excellent. Countries: Taiwan, Iceland (all 5 trips), Sweden (all 3 trips) France (both trips), Santa Fe New Mexico, Chicago IL, Washington state 5-day and 10-day tours. Moderate: These tours require a minimal amount of physical abilities, you need only be able to walk short distances and be able to handle heat, humidity or cold and high-altitude conditions. Most places we stay at usually have reliable electricity, but there have been short periods of electric outages in the past. The countries generally have “fair - good” medical facilities that are usually 1 – 4 hours away. Public health and transportation standards are considered “fair – good” depending on the specific country. Countries: Argentina (both trips), Colombia Andes, Nicaragua (3 trips: Cloud Forest, Volcanoes, Pacific), El Salvador, Guatemala, Uganda, Cambodia, India, Korea, Nepal and Sri Lanka. Adventurous: These trips require you to be in good physical shape and be healthy. You will need to carry your own luggage and/or backpack. Some of the places we stay at do not have electricity, some might have a generator for a few hours a day. Sometimes the lodging does not have hot water. The countries generally have “good” medical facilities, but access might be 1 – 2 travel days away. Countries: Borneo, Mongolia, Colombia Amazon, Nicaragua (2 trips: Rainforest and Corn Islands).